The house of Maison Margiela is known for deconstruction and discretion. The Belgian designer Margiela has never even appeared on the runway for any of his shows, and wishes to be completely anonymous (here is a wonderful resource with more information if you’re interested). However, whether that is why John Galliano, who recently took over the reigns as designer for the house, did not take a bow and instead let his work stand for itself at its Paris Fashion Week show is up to you to decide (the designer was briefly out of the fashion world since being fired from Dior in 2011 for an anti-semitic rant at a bistro in Paris, then spent some time in rehab). Maison Martin Margiela’s style has always been gritty, minimalistic, and art-centric. Enter, these Maison Margiela hand-painted booties. 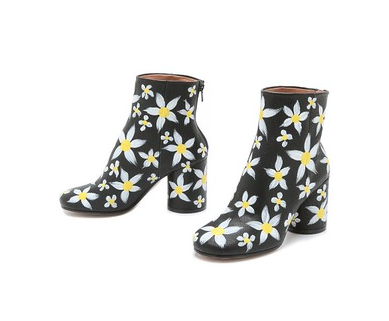 They’re certainly out there, but the style is a Margiela signature design, and are kind of like high-fashion’s answer to floral Doc Marten’s. Pair it with this adorable matching silver-plated daisy earring for a perfect Spring outfit. What do you think of these booties?